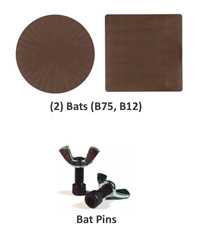 With Free Shipping, Splash Pan, Bats ! Boasting a 10-year warranty, the Speedball Boss Elite SQ pottery wheel offers the same high-quality performance of other wheels at an exceptional value. Possessing features and capabilities that artists demand at a price that can’t be matched, these wheels are the new industry standard. Each wheel also includes (2) free bats . New! 1/2" thick polyethelyne tabletop and expanded, raised work table. There is a 10-year warranty on the Speedball Boss Elite SQ pottery wheel.